The sudden surge of heat, redness, and sweat can be uncomfortable, disruptive, and get in the way of living a carefree life. When you are constantly worried about when your next attack will be, it can add unwanted anxiety to your days. Unfortunately, stress can actually increase the severity of hot flashes, so it is important to mind your stress levels. Finding methods of relief from tension in the body can reduce the intensity of your symptoms and promote tranquility. Meditation is a way to gain direct control over your stress levels. Meditation teaches individuals how to cope with and release negative thoughts that can add tension to their body and mind. Typically, when one feel stress coming on, it causes the release of cortisol in the body, which quickens the heart rate and increases body temperature. However, when one knows how to meditate, they intercept that process with deep breathing and positive intentions. Try meditating around 20 minutes daily. Turn on ambient music, close your eyes, and inhale deeply for five seconds, then exhale all your worries out for five seconds. Yoga helps regulate oxygen and blood circulation in the body through a series of balancing, stretching, and strengthening postures. It also teaches individuals how to breathe deeply through challenging poses. The central focus on the connection of movement, breath, and mindfulness helps center and de-stress while increasing the production of gamma-aminobutyric acid (GABA). This neurotransmitter actually promotes feelings of deep tranquility. Also, every class ends with a cool down, then a short meditation session. Cardiovascular exercise is important for overall body temperature regulation and anxiety relief. It can be hard, however, to convince a women prone to hot flashes to run in a sweaty gym. For this reason, swimming is often the preferred heart-healthy activity for cooling down and relaxing. Dip into a nice cool pool whether in your backyard or at the nearest public pool. It will work your whole body while increasing serotonin and endorphin levels, inducing happiness and calm. At the end of the day, if you still feel some tension built up, valerian could be a helpful herb. This plant is powerfully sedative and can allow you to have a restful, peaceful night's sleep. Individuals who take it, whether in tea or supplemental form, report relief from the symptoms of stress and insomnia. If you opt for tea, make sure to have it iced, since hot drinks are known to trigger hot flashes. Do not let stress dominate your life. Worrisome thoughts are more powerful than many individuals realize, and can directly affect bodily processes. 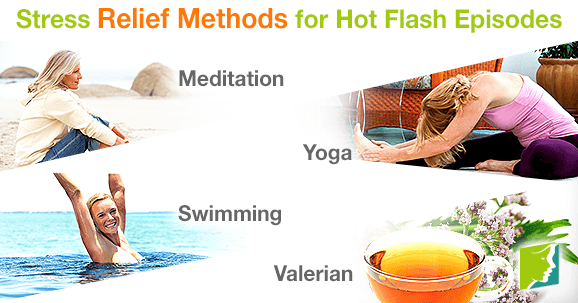 Gain control of your body temperature and heart rate via these positive and effective methods for relieving hot flashes. Not only will you feel cooler, but you will also notice a profound improvement in your attitude toward life. Hot flashes and night sweats are experienced by 75% of women during perimenopause and 50% of women during postmenopause. Click here to learn how the Mediterranean diet, dietary fiber, and even cinnamon can lessen hot flashes and night sweats in menopausal women. For hot flashes, there are few nutrients that you should consider. Check out those top 5 vitamins and minerals to help manage your hot flashes.